5 April 2019 (United Nation) – The Venezuela refugee crisis, which has already left some 1.1 million children, returnees and people in-transit lacking protection and basic services across Latin America and the Caribbean (LAC), has prompt the UN Children’s Fund (UNICEF) to call on regional Governments to uphold their rights and protect unaccompanied, undocumented children. 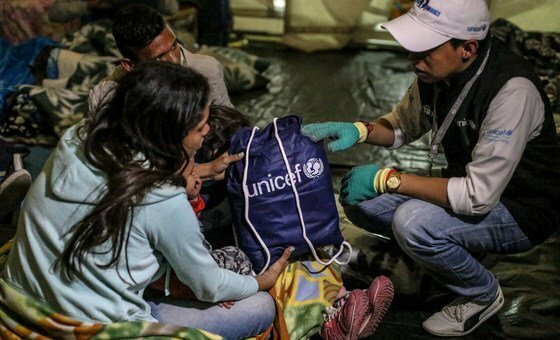 “UNICEF is encouraged by Governments’ efforts to jointly seek regional solutions to the challenges posed by largescale migration that are in line with international standards and national laws, such as the protocol adopted by Ecuador to protect uprooted children,” said María Cristina Perceval, UNICEF’s Regional LAC Director. Since 2015, amid spiraling hyperinflation, shortages of basic goods, political turmoil, violence and persecution, more than 2.7 million Venezuelans have left the country to seek safety or a better life abroad, according to the Office of the UN High Commissioner for Refugees (UNHCR). Moreover, host countries lacking clear migration policies, put children at higher risk of discrimination, family separation, xenophobia and violence – with unaccompanied and separated children, pregnant women, nursing mothers and indigenous people at even greater risk. “Human rights standards call for States to allow children entry and registration as a precondition for carrying out initial protection assessment procedures,” stressed Ms. Perceval. “Even when they are unaccompanied and without official documentation, they should be immediately directed to specialized personnel, who can assess their protection needs”. In addition to providing States with valuable planning and budget information, UNICEF called registering children on the move “the first step in guaranteeing their rights”. The agency has appealed for $69.5 million to meet the needs of migrants across the LAC region. Despite Venezuela’s official land-border closures with neighbouring Colombia and Brazil in February, thousands of people continue to flee daily, many risking their lives by wading across torrential rivers or facing exploitation and abuse by armed groups controlling treacherous pathways, according to UNHCR. UNHCR spokesperson, Andrej Mahecic, toldreporters in Geneva that “the crowds were a result of the Tachira River swelling, which in turn is making crossings by foot even more dangerous than usual”. Since 23 February, when the Venezuelan restrictions on border crossings were instituted, people have resorted to using muddy footpaths known as “trochas” and wading across the Tachira River to get to Cucuta where they work, study, and get medical attention, food and medicines unavailable at home. Thousands of others enter en-route to other Latin American countries. “With heavy rain having swollen the river and flooded many of the footpaths, the only viable option for most Venezuelans was the bridge”, he explained, adding that the situation illustrates the dangers of irregular cross-border movements by desperate people. Although river’s current had temporarily subsided by mid-week, the onset of the rainy season means “crossings will continue to be highly dangerous”.